This year, I had the possibilities to go out every day and thus recharge my batteries a little bit. As a result, the store of pictures of birds and nature has been replenished somewhat. My wife wanted to go fishing, so fishing we went. However, she holds the license and the rod. I’m the one sitting and waiting for fish to bite . I chose the alternative and shoot some birds instead. These shots came all from the same area, namely Chalet Beach. It’s mostly known by fishermen and Cottagers. The birds are being left alone there. They didn’t get any harassment from me either. Many of the birds were simply doing their business as usual, without even acknowledging me. That’s the way I like it! 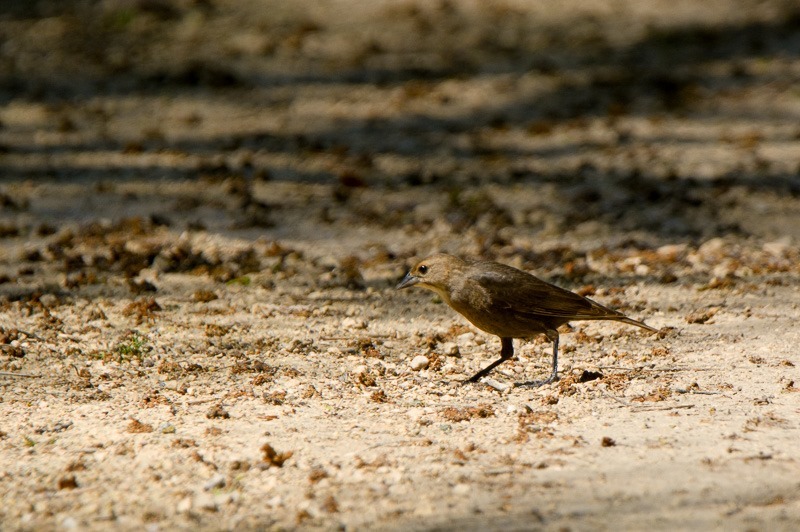 The above female Cowbird was looking for nesting material, coming out of the undergrowth from time to time. Her mate seemed to prefer to overlook the situation and give directions instead. 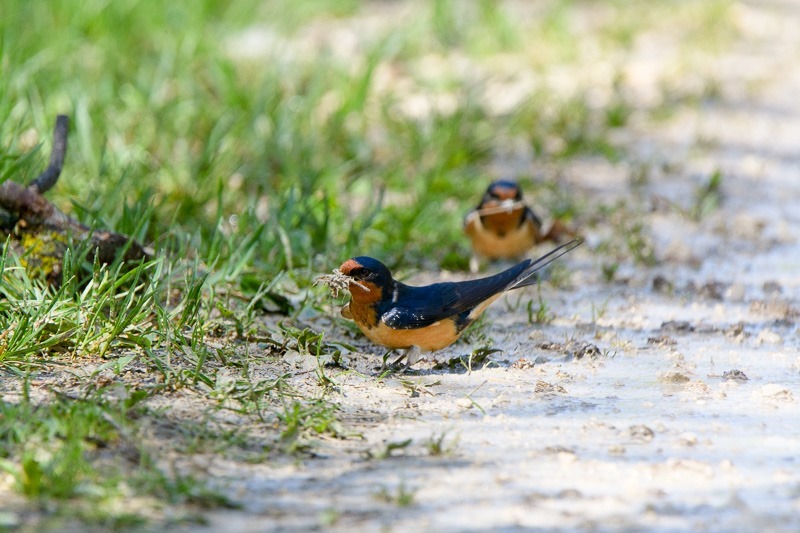 These Barn Swallows had the exact same idea, except that shopping for nesting material looks a but more human: the male is also dragged into the process . These little birds were not concerned with my presence at all. They came back over and over again to get more nesting material. I did not spot the nest. 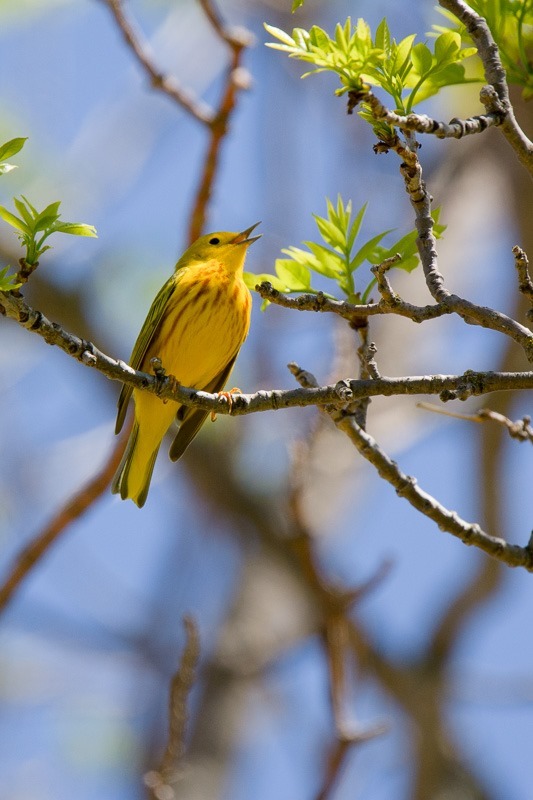 Others were singing their hearts out like this Yellow Warbler. I could hear him from far away. Bright as they are, this one was easy to spot. There were a lot of them around. They might be easy to spot, but to catch them sitting still was another matter. Since it was nice and warm, they were busy with all kinds of Warbler business, incessantly moving around. 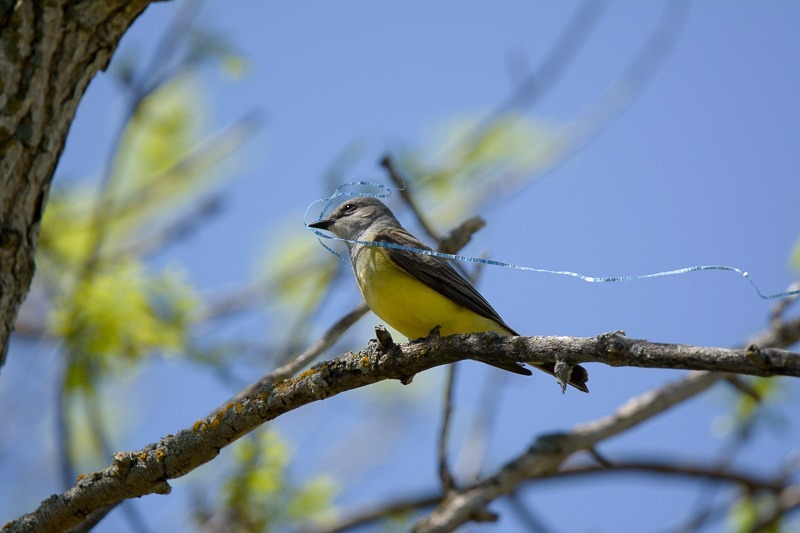 Then there were the Western Kingbirds, also building their nests. The choice of nesting material for this one looks a bit scary, the young could get caught in the tough plastic and never get away from the nest. These Kingbirds were everywhere, a real birder’s paradise or photographer’s honey hole. 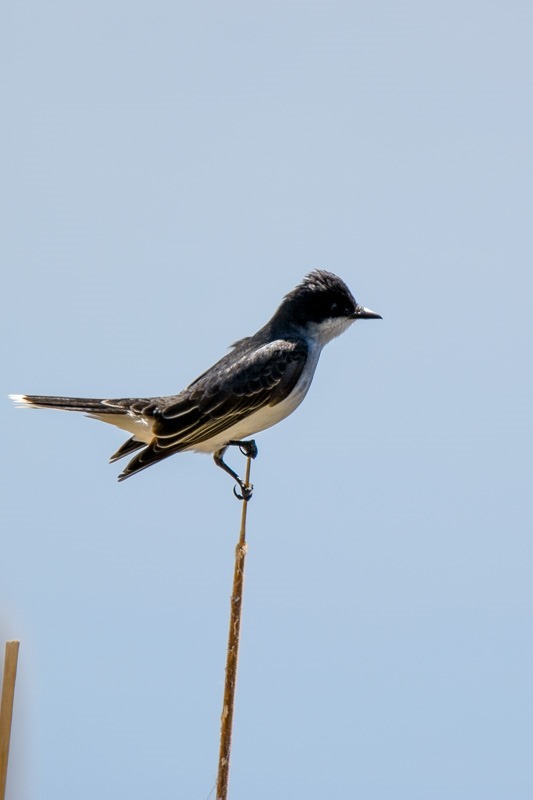 The Eastern Kingbirds were also represented. 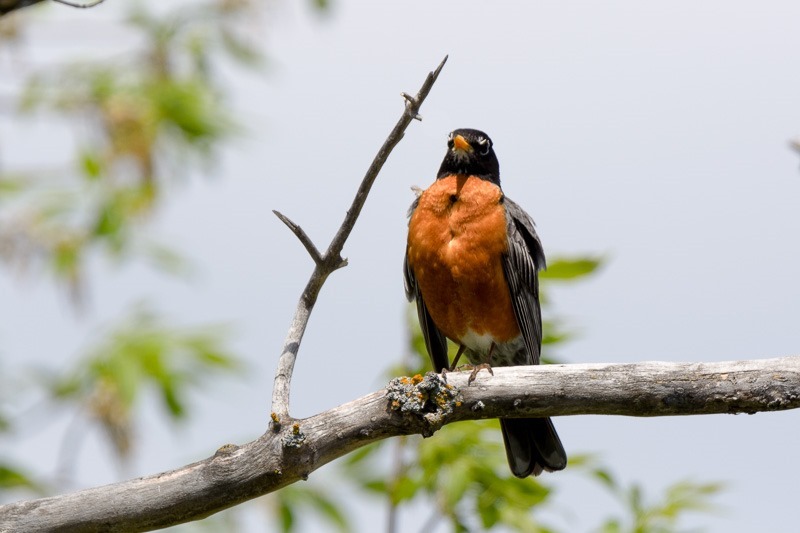 Their reputation is reflected in their Latin name: Tyrannus Tyrannus. They do not tolerate any other bird or animal in their territory and will actively make sure intruders go away and never come back. The tiny little hook on the tip of their beaks is a fierce weapon many birds have had to deal with. The Tyrannus Tyrannus will go straight for the eyes, making any further attempt for attack a very scary undertaking indeed. 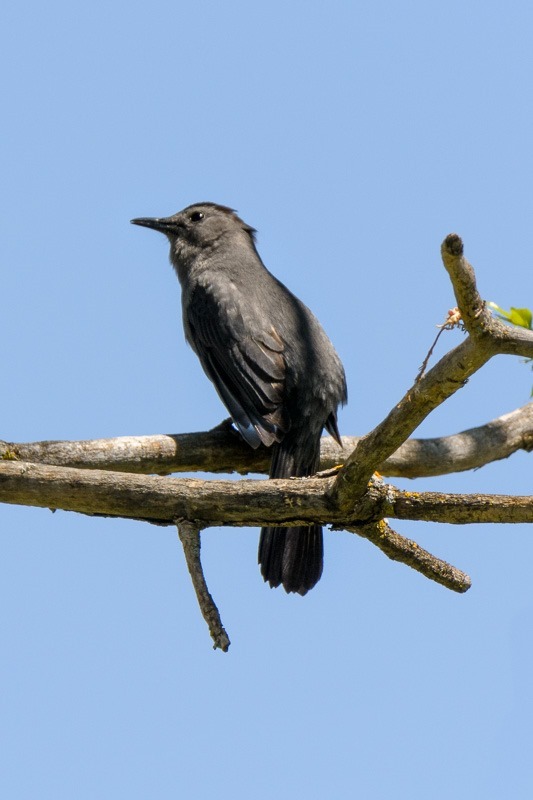 The Grey Catbird made a small appearance as well. At first I thought a small cat was caught in the bushes somewhere. The whiny sound of meowing really resembled that of a cat. Until I spotted the Catbird. Their call resembles the meowing of a cat like no other. After the birds I tried to shoot something else, without any hope of getting results. There were a lot of huge dragonflies flying around me. Having only my 150-600mm on my camera, the minimal focusing distance was something like 4 metres. I stepped back and tried to get one of them. The result is quite nice, even if I say so myself. 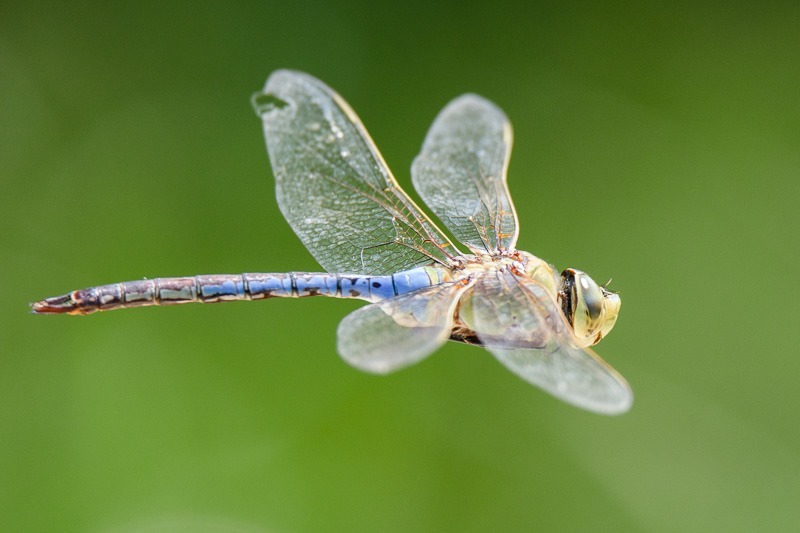 This dragonfly was hunting in a specific pattern, which gave me the possibility to anticipate its movements. And so I spent day One of May Long Weekend. No computers in sight other than for the pictures, no programming and no shopping. All good for recharging the batteries.